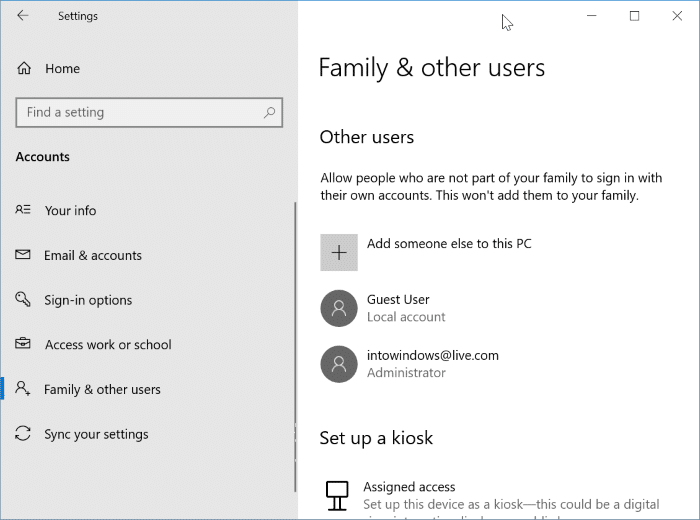 In addition to the standard local user account, Windows 10 also allows you to sign in with a Microsoft account. A Microsoft account is nothing but an email account from Outlook.com, Hotmail.com, Live.com, MSN.com or any other webmail service from Microsoft (you can also use Gmail or Yahoo email to create a Microsoft account). Signing to Windows 10 with a Microsoft account has many benefits. For instance, you can sync settings across your devices, remotely sign out and lock your PC, and track your lost or stolen PC with Find my device. But users who don’t want to use a Microsoft account due to privacy reasons might want to delete the Microsoft account from Windows 10. If you have decided to delete the Microsoft account and use a local user account instead, you can migrate your existing Microsoft account to local user account without losing any data. This is the best way to switch to a local account from Microsoft account. Can I delete a Microsoft account from Windows 10? Of course, you can delete a Microsoft account from Windows 10. However, remember that you cannot delete the Microsoft account that you are currently signed in (you can migrate to local account) to. In other words, if you have only one account on your PC, you cannot delete it. 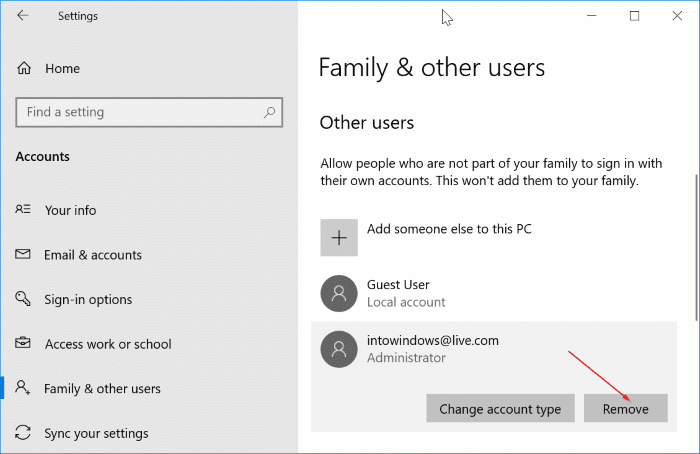 If you have only one account, you will have to create another local or Microsoft account with admin privileges (see how to create an admin account) and then delete the Microsoft account that you would like to remove. Deleting an account will remove all data in it, including data in the Desktop, Documents, Pictures, Music, Pictures and Downloads folder. If you have any important data, it’s advisable to move them to another location on your PC or transfer them to an external drive before deleting the account. NOTE: Please note that you must sign out of the account first to be able to delete it. You can either manually sign out or simply reboot your PC once to automatically sign out of all accounts. Step 1: Open the Settings app. Navigate to Accounts > Family & other users. Step 2: The Other users section lists all user accounts exist on your PC. Step 3: Click on the Microsoft account that you would like to delete and then click the Remove button. The account that you are currently signed in to doesn’t appear in this list. Step 4: When you get the confirmation dialog, click the Delete account data button. As said earlier, all data present in that account will be deleted along with your Microsoft account from your Windows 10 PC. How to install and use Windows 10 without a Microsoft account guide might also interest you.